Before however, the default logo and text read: dsMobileIDX. Which doesn’t necessarily line up with your site’s branding. Click on “Upload Image” under the Favicon/Home Screen Option – and upload your own custom image. 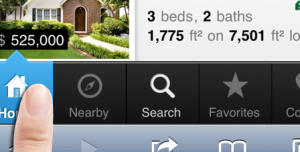 Now, the next time a client bookmarks your home search page on their mobile device, they’ll have a nicely branded icon. As mobile internet usage continues to grow dramatically, real estate agents need to invest more in mobile marketing to stay competitive and capture more leads. Click here to register now and learn more about our mobile home search! I see where to add the logo, but where can I change the title text?